DNA fingerprinting, a state-of-the-art practice used by forensic scientists, determines a person’s identity through DNA analysis. The lab activity brings the science of DNA fingerprinting into the classroom without the need for expensive equipment. Students sequence DNA with colorful pop beads, solving a murder mystery and learning about electrophoresis in the process. The activity comes with enough materials for 15 setups, a teacher’s guide, and student copymaster. 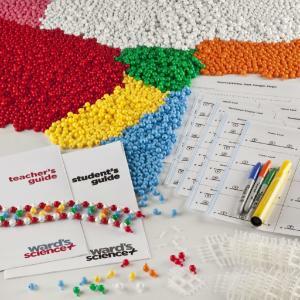 Ordering information: Activity contents include Red pop beads (phosphate), 5-hole white beads (deoxyribose sugar), Orange pop beads (thymine), Yellow pop beads (adenine), Blue pop beads (cytosine), Green pop beads (guanine), Pink pop beads (radioactive phosphate), Plastic connectors (hydrogen bonds), Sheets Jan I restriction enzyme cards, Sheets Ward II restriction enzyme cards, Sheets alkali cards, Sheets probe cards, Sheets suspect/victim/murderer DNA strips, Self-sealing bags, Blue marker, Yellow marker, Green marker, and Orange marker.